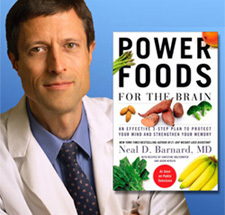 This week's book for my review is by Dr Neal Barnard and is entitled: Power Foods for the Brain: an effective 3-step plan to protect your mind and strengthen your memory. The book is about how you can use foods to protect your brain and optimize its function and even reduce your risk of Alzheimer's disease, stroke, general cognitive decline, and other less serious disorders such as low energy, poor sleep patterns, irritability and lack of focus. Dr Neal Barnard is President of the Physician's Committee for Responsible Medicine, which is a non-profit organization involved in promoting preventive medicine and responsible research in medicine. He has written many other books : Neal Barnard Amazon Book list, many of which I have read. Power Food for the brain is his most recent, just out this year. Step 1 deals with what foods are "power foods" for your brain - which can shield you from toxic metals, which can protect you from harmful fats. It also tells you which foods you should avoid. Step 2 looks at how you can strengthen your brain through exercise - both cognitive exercises and also physical exercises. Step 3 shows you tips on how to improve your memory while you sleep and goes over which medicines and health conditions affect memory. A final section then helps you put all this into practice and includes some menus and recipes, written by Christine Walternyer and Jason Wyrick. Dr Barnard has a great way of providing clear and easy to understand information, all based on plenty of scientific research. I've attended several of his lectures in the past and he is a great educator. This comes over in this book. As does his sense of humor. His use of analogies really helps get the information across to the reader. Dr Barnard advocates a plant-based diet and offers the evidence behind this - but also demonstrates the real power of good nutrition. It shows you what an approachable guy Dr Barnard is. You'll find lots of other videos of his online - so have a search and learn more! This is a great book. If you are beginning to notice some cognitive decline, get a copy and even if you don't do his whole program, you'll find lots of little tips for improvement. Thanks for taking the time to add a comment. Tickety-boo: adj.- going smoothly, doing alright. Working either in small groups or one-to-one, Tickety-boo nutrition and health coaching guides cancer patients from fear to empowerment and supports everyone to create a healthier life, with a focus on preventing disease. We work together through education and individualized coaching that takes into consideration your personality, your values and beliefs, and your personal circumstances. One plan does not fit all and so we find YOUR motivation, overcome YOUR obstacles and achieve YOUR goals, with the end result being a healthier, empowered YOU. I was born in England and moved to the US in 1996. The idea was that we'd just come for a year - but we kind of forgot to go home! We do visit family and friends back there twice a year however - so don't have chance to feel homesick! After working as a research pharmacologist in England, I went back to school when we came to the US and gained my Master's degree in Health Psychology. I am also a certified Health Coach and a cancer guide. I currently live in Northern California with my husband and pet parrot Harold. We have a small vineyard and grow Merlot grapes which we sell to a winery. Life is tickety-boo!